American epic atmospheric black metal band Ered Wethrin, the solo project of Sven Smith from Salt Lake City of Utah, has just released its debut full-length album “Tides of War“. Sven formed the band back in 2004, but he never released anything with Ered Wethrin all these years. He managed though to gain the attention of the German label Northern Silence Productions, who signed the band. Finally, their first full-length album was out on February 14th 2014, containing a lot of material that has been written during these past years. “Tides of War” is a very long album, since its 7 songs last for almost 68 minutes. 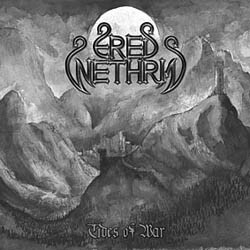 Ered Wethrin play epic black metal with atmospheric black metal elements and some symphonic touches. The band has a quite raw old school black metal sound and its music is closer to the underground aesthetic. Sven uses beautiful atmospheric background synths, his compositions though are clearly guitar driven. He does a great job with beautiful epic guitar riffs and melodic leads, that most of the time move in slow and mid tempos; five of the songs clock at 10 minutes or longer. I’d say that Ered Wethrin belong to the “brutal” side of epic fantasy-based black metal and at the same time they have found a very interesting balance between aggression and melody. Sven’s vocals are fierce black metal shrieks of an almost “acidic” nature, in par with the raw sound of the guitars. Luckily, there are also a few more melodic parts, where he uses clean choral-type vocals, adding a bigger variety in the album, like in the amazing “Into the Stars“, one of the album’s highlights. Despite the long duration of the album, his music avoids repetition, since his song structures are quite versatile and he doesn’t repeat the same motifs or refrains. The album is based mostly in the overall epic melancholic atmosphere it creates and less in the catchy majestic melodies that many bands of the genre usually prefer. This type of songwriting makes music more “difficult” to comprehend at first, but it rewards the listener through time, since he has always a new detail to discover! There are of course some nice epic synth-based melodies too, like the enchanting closing track “Stellar Graveyard” and a few instrumental passages, making the compositions sound more accessible. The lyrical concept of the album is based on various epic fantasy books and all lyrics are included in the CD booklet. Ered Wethrin is a band whose debut effort deserves your attention, especially if you are into epic atmospheric raw black metal. I hope Sven won’t need another ten years for a new release and I’m looking forward to see how this band will evolve, since there are many wonderful moments in the album. “Tides of War” is released by Northern Silence in a limited to 900 copies 4-panel digipak edition with golden disc. It includes an 8-page booklet, whose cover artwork and logo are painted by Dan Capp. You can visit the band’s official pages below and get a first taste of their music.